His Excellency the President of the Republic of Ghana will be the Special Guest of Honour at West Africa’s premier mining and power expo this year. President Nana Akufo-Addo has confirmed his attendance on the first day of WAMPEX 2018 to mark the 90th anniversary of the The Ghana Chamber of Mines. He is expected to speak at the WAMPOC 2018 conference. “We are honoured to have the President of Ghana attending this year’s event, which is the key mining expo and conference for West Africa,” said Brad Hook, Commercial Director for the co-organisers of the event in Accra. The President has made mining in his country a top priority since he took office a year ago and he is expected to re-iterate his support for the commercial success of the sector – but not at the expense of the environment. 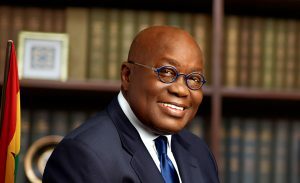 Earlier this month (Jan 17) he spoke to journalists in Accra where he has promised to end illegal small scale mining, known as galamsey, where individuals often with the support of foreign operators employ destructive heavy machinery to mine and fail to dispose safely of processing chemicals like mercury. The President has warned this is a serious menace to the very existence of the country. “As I have said a few times, since the Almighty blessed us with precious minerals, there has always been and always will be mining in our country,” said the President. Ghana is the heart of the West African mining sector and the WAMPEX 2018 expo and WAMPOC 2018 conference is expected to be bigger than ever this year thanks to commodity price stabalisation and greater government support across Africa. Exhibitors from around the world will be at the Accra International Conference Centre from May 30 to June 1 for WAMPEX, and WAMPOC, The West African Mining & Power Conference 2018, which brings together senior government officials, industry leaders and influencers to discuss policy, legislation, challenges and market developments. The event is endorsed by The Ghana Chamber of Mines, The Ghana Ministry of Lands & Natural Resources, The Minerals Commission of Ghana and The Energy Commission of Ghana. For more details of the expo and conference go to www.wampexghana.com.